Sunny and warm weather drew a large crowd to Show Court Court 18, but the inevitable Opelka victory when he served for the match at 6-5 and then again when he took a 5-0 lead in the ensuing tiebreaker, changed to uncertainty when Opelka made two unforced errors serving at 5-0. Fritz held his two serves to make it 5-4, but Opelka still had two serves coming. With 18 aces and no double faults, Opelka couldn't was in no position to complain about his serving stats, but again he was unable to finish it. A great forehand pass by Fritz made it 5-all and an outstanding return of a 132 mph first serve made it 6-5 for the Californian. "Way to choke," Opelka said to himself, but it was Fritz who didn't come through on the next point, netting a makeable backhand to make it 6-6. "It was 100 percent choking," Opelka said of his performance from 5-0 up. "He played well. It's obviously not easy to make the returns he was making, and in the big moment he made me play. But 5-0 serving to 5-6 down him serving, that's a joke." Opelka, who saved a match point in his 4-6, 6-3, 13-11 win over qualifier Alex De Minaur of Australia, said Fritz's miss on that set point was unexpected. "It was lucky. 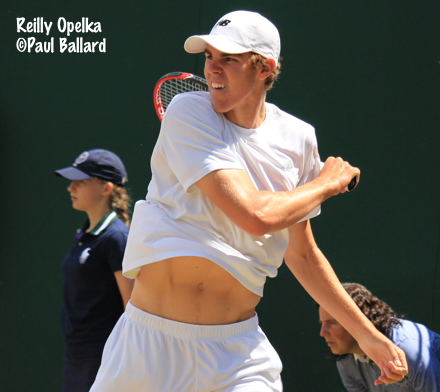 That's his best shot probably and I kind of got a break there," said Opelka, who will be 18 next month. Although Fritz had two more set points, with Opelka serving at 10-11 and 12-13, Fritz thought the first was his best opportunity to extend the match. "I really think 6-5 was my best chance to do it," said Fritz, who had a nasty scrap on his knee from an encounter with the no-longer-grassy court. "Even though I had other set points, that was the one I needed to take it on. I just didn't know what to do with that backhand." Fritz was disappointed that he was unable to force Opelka to play a third set. "In that tiebreaker I finally figured out some things," said Fritz, who broke back twice in the second set, when Opelka served at 3-2 and 6-5. "Toward the end of the tiebreaker, I was making every return. And I just wanted to push it to a third set so bad, because I really felt like I was on to the serve. I thought once I got the pressure off me, got a set even, I'd start serving better, but unfortunately I couldn't push it there." Opelka was relieved that Fritz did not seize those opportunities. "It would definitely have been tough mentally to recover and get ready to play another set," said Opelka, who reached the quarterfinals last month at the French Open. "It was definitely easier to get it done in two, but I kind of let him back in the match up 5-0 in the breaker." Opelka's opponent in Sunday's final is No. 12 seed Mikael Ymer of Sweden, who defeated unseeded Patrik Niklas-Salminen of Finland 7-6(3), 6-3 despite a visit from the doctor before the match began. "I think I stayed pretty cool, even though I was very dizzy in the beginning," said the 16-year-old, who was playing in his first junior slam semifinal. "Everything was spinning, I don't know what happened, that's the first time I've felt like that. But I managed to control that and I'm very happy." Ymer lost to Opelka 6-4, 6-4 in the second round of the French Open, so he knows what he's facing. "He's a great player, huge shots," Ymer said. "I'm going to have to serve good, stay cool, take my chances. It's going to be tough, but I've talked to my team to see how I can do better than French Open, make him serve worse, so we'll see." Opelka also knows what to expect from Sweden's top junior. "I know he's really physical and makes a lot of balls," Opelka said. "He moves really well and he's definitely going to make me play a lot, and I just have to play my game and execute, like I did today." The first all-Russian girls final since 2002 will take place on Saturday, with unseeded Sofya Zhuk facing No. 12 seed Anna Blinkova. The 15-year-old Zhuk had little trouble with an error-prone Viktoria Kuzmova of Slovakia, needing less than an hour to post a 6-1, 6-3 victory over the qualifier. "I had never played this girl, but I saw a couple of her matches, how she played," said Zhuk, who lives in Russia but also trains at Justine Henin's Academy in Belgium. "I knew what she was doing, so I was really ready for this match. I really pushed her from the beginning, because I know that if I go a little bit back, I let her play, she will begin to play her best tennis. But if I push her every ball, she can't do that." Blinkova, who needed over three hours to defeat Tornado Alicia Black 1-6, 6-3, 12-10 in the quarterfinals, was poised to go three sets again when unseeded Vera Lapko of Belarus served for the second set at both 5-2 and 5-4. Lapko began to show her nerves when she did not convert on her set points at 5-2, and was broken at love in her next opportunity. She managed to save a match point down 5-6, but the tiebreaker was all Blinkova, who didn't have to do much to win it, with Lapko making five unforced errors, including a double fault. "I began the match very well," said Blinkova, who will be 17 in September. "I was very aggressive, played aggressive tennis in the first set. In the second set, she began playing very well, hitting hard, hitting deep and I had some problems. I was down 2-5, but then I began fighting for every ball and somehow it went the other way and I won 7-6." Blinkova has two ITF junior victories over Zhuk in the past two years, but their rivalry goes back farther than that. "When we were little we played against each other and she won twice or three times," Blinkova said. "Then I won two or three times. I know her quite well. It's very good for us that two Russian girls are in the final." Zhuk, who is playing only her second junior slam, is looking forward to getting an opportunity to compete on Wimbledon's famous No. 1 Court. "I was there for Maria's (Sharapova's) match with Zarina Diyas, and I was like, oh my god," said Zhuk, who has yet to drop a set in tournament. "When you're coming on the court, what feelings you have, playing first time Wimbledon and playing final on the first court. I really like to play here at Wimbledon, because there'a lot of people. I'm in love with that. I'm really playing better when there's a lot of people." The doubles semifinals are scheduled for Saturday, with at least one American boy assured of reaching Sunday's final. Fritz and Michael Mmoh, the top seeds, defeated Geoffrey Blancaneaux of France and Aziz Dougaz of Tunisia 6-2, 3-6, 6-3 and will play Opelka and Akira Santillan of Japan, the No. 4 seeds. Opelka and Santillan defeated Niklas-Salminen and Viktor Durasovic of Norway 4-6, 7-6(7), 6-2. The other boys semifinal features No. 5 seeds Miomir Kecmanovic of Serbia and Casper Ruud of Norway against No. 8 seed Sumit Nagal and Nam Hoang Ly of Vietnam. Kecmanovic and Ruud downed No. 3 seed Tommy Paul and Will Blumberg 4-6, 6-3, 9-7. The junior girls double Grand Slam watch continues, with top seeds Marketa Vondrousova and Miriam Kolodziejova of the Czech Republic rolling to their 13th consecutive junior slam victory. Vondrousova and Kolodziejova, who won the Australian and the French, will play No. 3 seeds Dalma Galfi and Fanni Stollar of Hungary in the semifinals. Galfi and Stollar took out the last American girl remaining by beating Ingrid Neel and her partner Maia Lumsden of Great Britain 6-0, 6-2. The wild card team of Freya Christie and Anna Brogan of Great Britain will face Lapko and Tereza Mihalikova of Slovakia in a match that scheduled for Court 1. Complete draws are here. Saturday's order of play is here. Additional coverage of Friday's semifinal action can be found at the Wimbledon website.